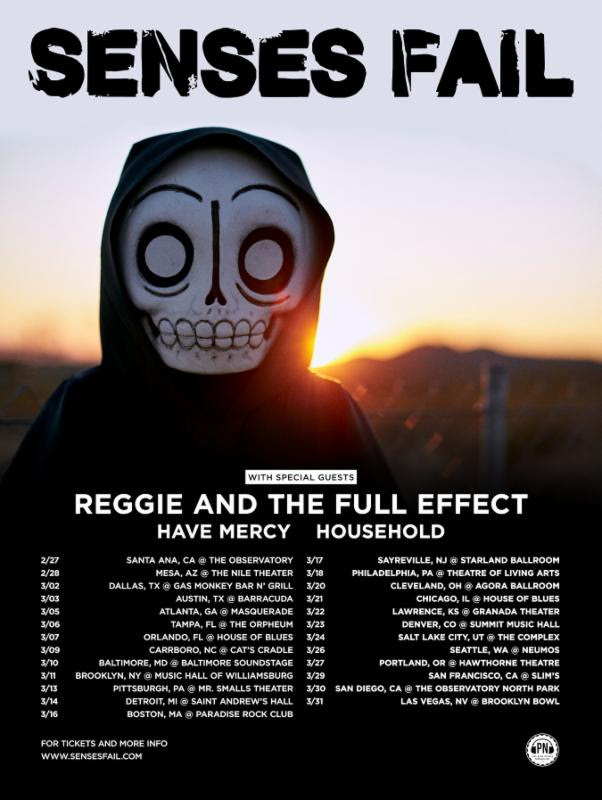 Senses Fail is thrilled to announce that they will be hitting the road for a full U.S. tour next year with support from Reggie and the Full Effect, Have Mercy, and Household. The month-long run kicks off on February 27th in Santa Ana and wraps up on March 31st in Las Vegas, bringing Senses Fail’s high-energy and passion-driven live show to fans across the country. Pre-sale for the tour starts today at 12pm ET, with general on-sale beginning Friday, December 8th at 12pm local time. For more information or to purchase tickets, visit here. Senses Fail recently shared their brand new single “Double Cross,” from the band’s forthcoming 7th full-length album, If There Is A Light, It Will Find You. The new 12-song album will be released on February 16th, 2018 via Pure Noise Records. If There Is A Light, It Will Find You was produced by Beau Burchell (Moose Blood, Saosin, Hands Like Houses) and is the first time singer Buddy Nielsen has fully written the entirety of the album alone. Nielsen experienced life-altering changes over the past two years that have contributed directly to the making of this record. The band has always been known for pushing boundaries lyrically and addressing topical issues from stage during a live show, but this time around you can feel the weight of uncontrollable stressors wearing down on Buddy as he navigates the listener through his personal life, from song to song.